Chlorine and Koi. Neglecting to control chlorine in the water in a koi pond can result in the death of the fish. Water treatment plants add chlorine to water to remove bacteria and parasites so the water’s safe for human consumption and doesn’t pose a threat. However, to koi, chlorine is toxic. Chlorine helps make our drinking water safe, but can cause all sorts of issues for ponds and fish. Chlorine is necessary in our mains water to control harmful bacteria growth which can easily make us sick if left untreated. Chlorine in low quantities isn’t harmful to us in tap water, but can still be easily removed by letting water stand or boiling it using a stove or kettle. Since chlorine is a gas by nature, it will slowly evaporate into the atmosphere as tap water stands and gas bubbles reach the surface. Even though chlorine is unlikely to cause any problems for us, it can cause all sorts of issues for animals more sensitive to the chemical – such as koi and goldfish. Chlorine is toxic to most aquatic life, and it can cause stress and nasty burns to pond fish once it enters the gills. Chlorine heavy water should always be treated for ponds with fish, especially if you’re performing a particularly large water change. Luckily, chlorine and it’s derivatives (see more below) can now be easily removed from mains water via several different methods; these include dechlorinator treatments, activated carbon, and dedicated filtration units. All of these options can remove residue chlorine making water much more comfortable and safe for goldfish, koi, and the rest of the pond’s eco-system. Water companies may be using either chlorine or chloramine to disinfect tap water, and both need to be removed. For the longest time chlorine was the disinfect method of choice for water companies, but in recent times a newer substance has emerged called ‘chloramine‘. Chloramine is a mix between chlorine and ammonia, forming a new compound which lasts much longer than chlorine and does not evaporate into the atmosphere. This is great news for water companies, as it means they can more efficiently treat tap water and it remains disinfected from bacteria for much longer. However, this is bad news for pond owners as it means you can no longer just let water stand to remove the substance, and many older water conditioners only remove regular chlorine, so chloramine would still remain. The solution? Making sure your dechlorinator treatments can neutralize both chlorine and chloramine. Newer water conditioners will easily remove both substances, so if you’re unsure which chemical is used to disinfect your tap water, it’s often best to go with a dual-treatment option to be safe. If you want to double check, you can also call your local water treatment company and ask what chemicals they use in their treatment process. Some counties and states will continue to use regular chlorine, but others may have started to adopt the newer chloramine treatment method – only way to know for sure is to ask! Why is chlorine dangerous to ponds and fish? Both chlorine and chloramine are deadly to aquatic life, causing burns, stress, and even death. Chlorine and chloramine are highly reactive substances that easily bind and react with organic compounds. Chlorine in sufficient doses is a highly effective disinfectant, which is why it’s used globally in mains water to destroy bacteria. The problem with this is the chlorine will not be able to distinguish between “good” and “bad” bacteria, and will quickly kill off all types of bacteria in your pond and filter box. Beneficial bacteria which are essential to a ponds biological filtration will also be destroyed by chlorine, which would result in a drop in water quality and a spike in waste substances. Chlorine and chloramine are also very toxic to aquatic life, with only small doses being needed to cause significant damage and stress to fish. Chlorine will cause burns upon contact, damaging the gills, scales, and breathing tissue of goldfish and koi. It also readily enters the blood stream after it passes through the gills, causing internal burning, stress, and significant pain to the fish. How do you measure chlorine? What is the ideal water value? Ideal chlorine and chloramine values in pond water should be 0.00 PPM (parts per million), or as close to zero as possible. Chlorine has no benefit in a pond and will only cause the death of bacteria and stress to fish, so the maximum amount should always be removed. In reality, it’s not always possible to remove all chlorine, so aiming for around 0.01 PPM is a reasonable goal if you have fish in your pond. If you get a lot of natural evaporation (hot climate) you’ll likely be topping off your water more often, so you need to be more careful about chlorine levels in comparison to someone in a colder climate. New ponds, and ponds which require frequent water changes, both can suffer with high levels of chlorine due to the frequency and volume of tap water being added. Chlorine can be measured using an electronic test device, or you can simply test your tap water for ammonia and if you detect trace amounts, it’s very likely you also have chloramine (being comprised of ammonia itself). The other option is to simply assume both are present and treat your water with both in mind. There will always be at least one of the two in your mains water, and since most commercial treatments can now remove both substances, testing isn’t always necessary. Recommended for: Smaller ponds with fish. Only works for chlorine. If you have a small pond and need to perform a small water change you can simply leave your tap water stand in a large bucket for 24 hours. This will allow chlorine time to reach to the surface of the water and escape into the atmosphere. Since this method requires no additional treatments, it’s a good budget option for smaller ponds with fish that don’t require large volumes of water for each top-up. Sadly, this method only works to disperse chlorine into the atmosphere, with chloramine being much heavier and more stubborn. If you have tested your tap water and it contains ammonia (meaning chloramine) or you have contacted your water company and confirmed chloramine, you would need to use a dedicated treatment option below instead. Recommended for: Small-large ponds with fish. Detoxifier Treatment removes chlorine, chloramine, and even ammonia and nitrites from pond water. The second option, and probably the most common, is to use water conditioners to strip the water of chlorine, chloramine, and other heavy substances. These are good options for both small and large ponds, and water can often be treated multiple times until the desired chlorine levels are achieved. They’re perfect for new ponds comprised of 100% mains water, and can also be used for every water change to neutralize harmful chemicals before they can interfere with the eco-system. Most newer water conditioners will be able to neutralize both chlorine and chloramine, but always make sure to check the label before purchase. Modern water conditioners can be used to treat water before adding to the pond (i.e., in a bucket) or they can be added straight to the pond with fish. This makes them a flexible choice if the water is already in your pond and you’re worried you still have residue left behind. The two decholrinator treatments we recommend are API Pond’s Chlroine and Heavy Metal Neutralizer and Pond Prime’s Chlroine & Chloramine Remover. The API Pond treatment will also remove heavy metals, such as zinc and lead, whereas Pond Prime will help remove excess ammonia and nitrites. If you just care about the removal of chlorine and chloramine, both treatments work great and you can’t go wrong with either choice. Activated carbon helps neutralize organic pollutants that regular filter media cannot remove. 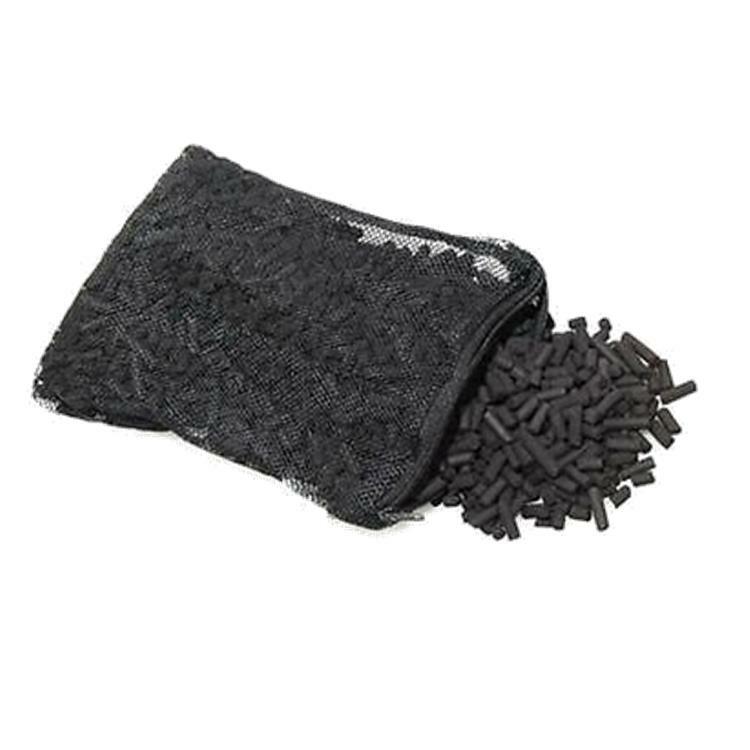 Activated Carbon is a method of water filtration to remove heavier organic pollutants that normal mechanical and bio-filtration cannot remove themselves. The carbon works via a process called ‘adsorption‘, which causes substances to stick to the surface of the carbon itself. The compounds stick to the carbon, become neutralised, and the carbon is then eventually replaced when the surface becomes saturated (approx every 2-3 months). Pollutants such as pesticides, perfumes, medicines, tannin, and even chlorine and chloramines can all be removed via this process. Activated carbon is great for adding extra polish to water, enchaining the clarity, but also works to remove chlorine and chloramine from the pond during water changes. Since activated carbon is fairly cheap to replace, many fish keepers choose to keep a constant supply in their filter box to maximize water quality and remove any residue pollutants. It can be used all year round for better filtration, and has no real drawbacks apart from the costs. You can use carbon to treat water before adding it to a pond, or you can simply add carbon to your filter box which will eventually cycle the chlorinated water and neutralise it. It is especially useful for brand new ponds during cycling, as it will help bring down chlorine levels and improve bacteria populations so you can safely add fish. For more information on activated carbon, check our full article here. Carbon filter hose attachments are a convenient option for pond owners who perform regular water changes. An interesting method to reduce chlorine and chloramines from mains water is by adding a carbon filter to the end of your garden hose. Since most of us likely carry out water changes and refills using a hose anyway, adding a carbon filter means no further treatment is needed and you can top up water whenever you want. These kind of filter attachments have become popular for drinking water and gardening, but they usually lack the capacity to make them effective for pond use. Most filter cartridges would run out within a few hundred gallons of water, and that is not ideal for larger ponds as you’d be replacing constantly. However, newer models of filter attachments are arriving with a much larger capacity (5,000+ gallons), meaning they’re much better suited for pond water changes. The device is fitted to the end of your hose and contains a activated carbon filter chamber, and when water passes through, the carbon will help neutralize chlorine and chloramine just like regular activated carbon (above). The benefit of this method is it allows you to instantly add water directly to your pond without the need to treat beforehand or afterwards. If you’re interested in trying these attachments, make sure to invest in a filter with a larger carbon capacity or you’ll be replacing it frequently. Common commercial units are often only intended for small volumes of water, and you’ll certainly want something bigger for your pond. We recommend Ideal H20’s Inline Carbon Filter as it provides up to 8,000 gallons of filter life span, making it a great choice for both small and large water changes. Recommended for: Large scale heavy fish stocked ponds. Dedicated water filtration systems can be useful for large scale chlorine and chloramine removal. Although not for every pond owner, if you have a heavy fish stocked pond or perform regular water changes, investing in a dedicated de-chlorinator system may be a good choice long-term. These powerful filter systems are intended for industry and whole households, being able to remove chlorine, chloramine, and sediment from large volumes of water, very quickly. They use the same activated carbon as found in regular treatments and hose attachments, but on a much larger scale. The carbon is also refined to a high degree of purity, and designed specifically for maximize and optimal water filtration. Most systems have a carbon treatment lifetime of upwards of 50K gallons, so would likely work for years and years without the need of a replacement. While a bit overkill for small ponds, this is still a viable option for larger scale operations where maximum water quality is needed and regular water changes are performed (i.e.,fish breeders/sellers). These systems can also be connected up alongside a UV clarifier for enhanced purification, meaning more algae, tannin, and bacteria are removed, making water even cleaner.